Verse 4 is a continuation of the previous verses that list the sins God’s people have committed against Him. Verse 3 says they are a people that provoked Him to anger, sacrificed to idols, and burned incense on altars to other gods; continuing that list in these two verses shows us more of the depravity that Israel had been involved with. They stayed in graveyards, often overnight, performing rituals that were forbidden to God’s people. Graves were unclean in God’s economy. They should never have been there to begin with. 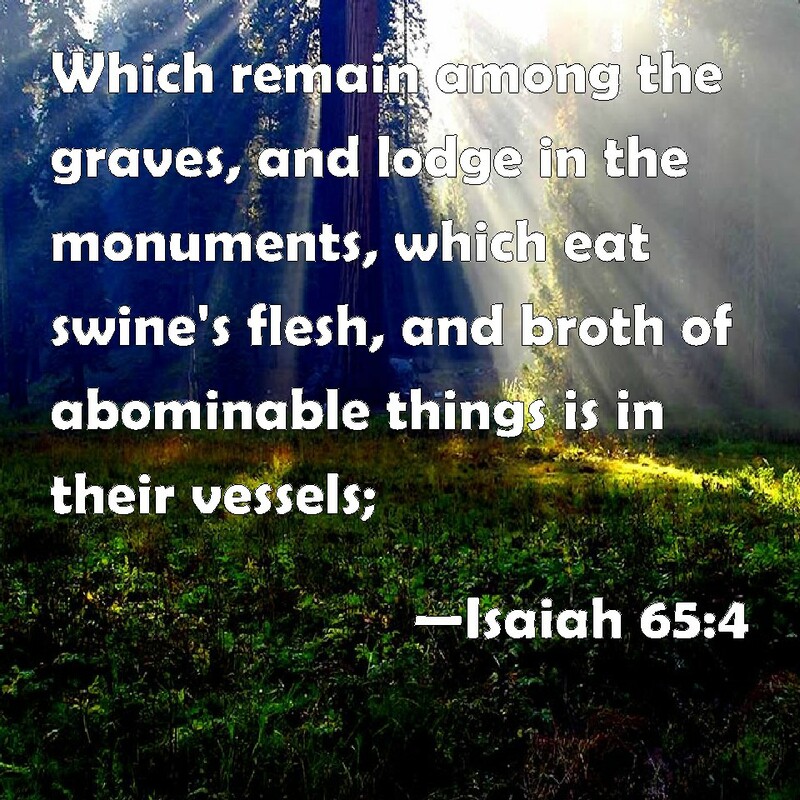 Of course we know that God listed “swine’s flesh” (pork) as an unclean food; the broth mentioned refers to the broth of unclean animals cooked in their vessels and used in the art of incantation or necromancy. It was the custom for priests of idols to call young women who would come into the presence of the idol to dance with them and sing aloud. Afterward, the women would bring in vessels of food which were placed before the idol who was entreated to eat. Broth made of flesh would be poured out before the idol to appease him. Verse 5 shows us the attitude of hypocrites, those who worship idols in particular. Such were a smoke in the nose of God, and a fire that burned in His wrath all day. This is why He was determined to stir Himself up to render to the idolaters the fruit of their rebellion.